November | 2013 | Whose Education Is It Anyway? I have struggled with event related posts in the past, for example, my old blog was largely made up of blow-by-blow webinar accounts with little commentary. However, I do believe in the value of disseminating the outcomes of attending events (especially when you are doing it ‘on the clock’). The only time this ever led to a problem was when some ex-colleagues queried the logic of sending me to an international conference at a time of cutbacks – I took this as a sign to encourage a push for more transparency over internal budgets, priorities and communication. In my current role, I have setup an in-house wiki for all members of the L&D community in my part of the business to feed back on external events and training. As a result of this, I now have a clear place for writing outcomes aimed at my colleagues/organization. “Longer narrative/explanation of the day’s sessions” (full details of events for anyone who happens to want to read it or has their interest piqued by 2/3). Don’s tweet leading to one of the busiest days of this blog’s life which, combined with the very popular LinkedIn post, has seen a lot more traffic come this way than normal. For anyone who has subscribed to the RSS feed as a result, thank you and do let me know what you think of the event report approach. Considering the current interest in content curation, as mentioned in posts including the GOSH event report, it was great to see a Learning Solutions article attempt to clarify what this means for instructional design. I personally have a real interest in curation as my background (in terms of my MA and MSc at least) straddles the value of information (re)sources and learning design. Indeed if you look at it from a HE perspective, content curation is not really new, it is about the valuable resources which support and enhance any learning from colleagues and/or experts. The article points out that designers already do sift through source materials in other contexts too. L&D departments realizing they can not ‘do it all’ – this is a response to the information revolution and a delayed response to the ‘1990 challenge’ outlined at that GOSH event. A late realization of the capabilities of Learning Management Systems to deliver resources and support communication/collaboration, not just SCORM-packages. This change being partly fueled by the move of LMS systems for ‘training’ beginning to use/include the features previously more common in ‘education’. Most noticeably, Moodle has spread into the in-house training sector (either vanilla or as Totara – partly helped by the cloud) as well as a realization of the possibilities via the functionality of SharePoint and other tools. The Learning Solution article correctly identifies this as moving away from the ‘single-learning-event’ training model. Democratization of digital production. Unfortunately, training providers got hung up on the ‘rapid’ development of SCORM packages a few years back rather than looking at the wider ecosystem. This has in many cases, I would argue, led to a loss of control over related issues such as tacit knowledge management and social learning as well as some misconceptions. Unfortunately, the Learning Solutions article echoes one of these misconceptions by arguing that ‘lower production values’ means low quality of learning. It clearly does not, and if your learners argue they can not learn from something because it does not look nice then you are failing to sell them the learning’s purpose. Leverage the sources of content curation directly from the SMEs – browser bookmarks, links currently hidden away on team sites, books in their offices, etc. Leverage the sources of current awareness – aggregate lists of recommended reading (email subscriptions, RSS reader exports) from SMEs and the training’s audience. L&D professionals as the organizational ‘guinea pigs’ – spend time test driving MOOCs and other resources prior to recommending to their audiences. Audio/visual solutions – iTunesU type in-house solutions, Mediacore, etc. I know a lot of organizations will have this already but I doubt many fully allow for upload/download flexibility across device and with appropriate curation tools (commenting, ratings, categories, etc). Data and semantics – many of the opportunities of ‘curation’ emerged from Web 2 (wikis, social media, etc). This video does a good job of summarizing that data, analytics, semantics, etc will bring the next set of opportunities. The first, of what the team at GOSH hope will be an annual, conference on learning innovation in the National Health Service (NHS). Although I am outside of the NHS, the presentations sounded interesting so I decided to attend. In reality a lot of the sessions were pretty generic and not public sector or NHS centric. There were a lot of interesting ideas discussed through the day in what was clearly a mixed audience in terms of awareness of learning technology, innovation, etc. The day certainly seemed useful especially to those newer to learning innovation/technology. #GOSHLIC2013 (although I totally failed to tweet on the day as I was busy chatting and typing). Delegates and sponsors presumed I was there due to the NHS/KPMG/LINE leadership development program [I had not realised quite how a big a project this was from the NHS perspective]. ‘Just Now, Just Right, Just Enough’ as a description of the post-Just In Time world was new I think [is this any different to the idea of ‘Just for me’?]. One of the sponsors = http://www.thelearningeye.com/ [although I do have a habit of forgetting the names of eLearning companies]. An outlined marketing approach (define audience > define proposition > how back it up – substantiation > call to action) more useful to think about than 9Ps [which is the main thing I remember from my marketing training]. 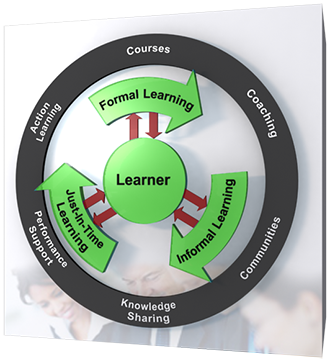 The Open Source, Adapt framework, being a collaboration between different eLearning vendors. I attend various things Don organizes so I had seen some of this before. However, it was still an engaging call for L&D departments to not ‘go the way of the typing pool’ and avoid becoming a redundant part of the business. Can remote learning be as social as face-to-face? I argued that it is social, but often in an ongoing form rather than the 8-hour classroom session followed by drinks model that people have become accustomed to. Change has ultimately been driven by cost cutting? eLearning and virtual classroom have been a response to funding and business drivers, not learning enhancement? A key theme to emerge here, and reoccur through the day, was the problems that compliance training in the NHS (and other industries) has created for eLearning. It was good to hear some stories of more engaging compliance items starting to bring that boat back to shore and help with eLearning’s image problem. We need ongoing learning to support evidence based practice but evidence in NHS of people cheating on eLearning (for example posting crib sheets online and having their team complete tests for them). Issue is the staff who think cheating is acceptable or the marketing of the eLearning (including the perceived importance staff hold for it)? There was an interesting metaphor thrown up in the discussions – L&D departments need to act like a DJ. We can have a planned ‘set’ but if no one is getting on the dance floors then we need to learn to change things to increase engagement and get people moving. The WWW and the change to ‘frictionless’ information, where we can find what we want in most cases without the need of an intermediary. The web shows change does not have to be difficult – users have adopted YouTube, Google, etc. without even thinking about it. RuderFinn index shows the web is primarily used for learning, issue for many corporates is that in-house systems are simply not as easy to use as websites so people ignore them [this is a similar argument that has been made against the continuing value of corporate information/library teams]. Tipping point between value of tangible and intangible value in organizations. World now all about skills and talent and L&D have not adapted appropriately. Hardware changes are increasing engagement with elearning via touch, voice activation, etc. Personalization of learning paths via improved systems that automatically recognize cross selling of content opportunities and your prowess. Rapid development tools for further democratization of learning production. Augmented reality for contextualizing the real world via web information. Virtual worlds maturing for specific uses in role plays and simulations, partly via gamification techniques. Ultimately he argued that the combination of the three can allow for a more fluid learning environment, both in terms of production (such as BT’s successful ‘Dare 2 Share’ program) and maintenance (moving things out of IT control and firewall problems). I would agree with Don’s point that these three are here to stay and that many L&D departments are well behind the general/end-user curve in adoption. The point he made about APIs linking more and more of these systems in the cloud, I would say, leads to the big challenge – that L&D successfully moves to full blown use of systems and data. The need to be more strategic and play a role in ensuring the business follows a route to success. That L&D need not be the producers of content but rather guide learners through our information heavy world to the bits of content which are of highest value to them. This kind of idea always, for me, brings us back to the question of what L&D/Corporate Universities are really for. This started with some background to mobile before a (very) abbreviated version of their design workshop (which they would normally engage with a client over half a day or more). Traditional eLearning assumed a person-to-PC-at-desk relationship. Now need to design for a less predictable learning environment, need to recognize workforce flexibility and mobile device use. Just In Case (JIC) training is old hat. Indeed Just In Time (JIT) is on its way out. Instead now talking about ‘Just Now, Just Right, Just Enough’. Argued against some of the myths of mobile [I would say a number of these were early presumptions which were never likely to be true]. Examples included that people will use devices in complex ways, for example starting tasks on mobile and finishing on a tablet/desktop later (this certainly chimes with me as I constantly send things between my 6(!?!) devices to action via my preferred UX/UI at the best time for me). Tablets were described as ‘consumption juggernauts’ changing the delivery channel of multiple industries. Learning needs to catch up [I wouldn’t disagree but I would also argue that consumption-centricity is a tablet myth – and will be increasingly so as Windows8 picks up]. I liked the idea of mobile as a frontier (as in Wild West or Final) and that it is still new enough for there to be ‘opportunities for all’. Think about development projects as a Venn diagram between audience, context and content. Google identify three types of mobile user: ‘bored now’ (for example when waiting for a friend or on a train), ‘urgent now’ (need to find something quickly like the nearest garage when your car has broken down), and ‘repetitive now’ (same content over and over, such as, how to do a task or checking the weather forecast). Paper prototyping of actual design. Following the workshop activity there was a bit on ‘what next for mobile?’. I would agree that it simply has to be seen as part of the mix/blend of what you offer in terms of resources. I would also agree that there is a long way to go to achieve true ‘just for me’ learning in most contexts, making use of your mobile’s functionality to recognize who and where you are and what you are doing. The session ended with a brief plug for Linestream, their solution to all of this. This session only got a fairly small way through the proposed slide deck but it still managed to consider some key messages that L&D could learn from marketing [‘content marketing’ is a bit of a buzz term at the time being the influence of which is being considered in various industries, including instructional design]. The second tends to be better than the first but neither is best practice if look at it from a marketing perspective. Personally, I would also point out that production values can often be irrelevant if you think how popular ‘user generated content’ is. using eLearning for compliance turns people off (as mentioned in the intro session). The presenter had a full 10 challenges list [slides were deliberately text heavy I’ll try and add a link shortly]. Audience – capture main stream of audience. Do not try to capture everyone, if spending money on advertising this is impossible, aim for centre of target. Indeed, if aim for specific audience you can hold community together (Sheila’s Wheels, etc build on prejudice or other hook). Understanding target market has ballooned as an industry – advertising huge part of big data. Proposition – engage with audience once you know them. Proposition all about the value they will get. Needs to be simple, short and to point – punchy. Can be something which seems odd or is not the main reason for buying a product (the hole in a mint for example) but about remembering the product – stick in mind of audience. Substantiation – how can you back up the proposition? About Features combined with Benefits = Evidence (essentially Kirkpatrick in learning context, substantiation of evidence of learning). Can use course descriptions to make case to potential users/learners. If we cannot provide evidence, via Kirkpatrick type approach, then the course is of questionable quality. However, the main point made was that it is difficult. In email marketing you only have 50 characters (for subject) that can make or break you. Need emotional tie in. Argued for the benefit of rhythm, the flow of words can be more important than content. Call to action – what do we do to get to the goal(s). The example here was an interesting one – how to chat up a lady. If marketing a fantastic product (i.e. you are Brad Pitt) then you perhaps don’t need to sell, more likely situation is that you need to break down the deal. Start with free content (glasses of wine) to get first goal, the contact point such as an email address (phone number). The initial target being to aim for another selling opportunity (a date). In other words…start communication to build on later for ultimate success (ongoing relationships). Overall, the session was a useful reminder that even when you think you have a captive audience you should still consider your ‘pitch’. This session sounded interesting but had a late name change to “10 trends for learning, technology and engagement in 2014”, a presentation covering the outcomes from Kineo’s latest research. 1/2 – Learning is pervasive seemed to merge in with Design and delivery in a pervasive world. 70/20/10 to 33/33/33 – social/informal/formal [of course there are multiple variations of this, including Q2 Learning’s]. Learning designers need to consider a more complex blend, including the informal and user generated content. New models are emerging, for example, a major bank has managers post blog entries to demonstrate competencies. Commenting, ratings and sharing by the audience can be used to judge quality. Tools can include Hangouts and Skype, many people are already familiar with them and it adds the social element to learning resources. 3 – Assessment is different in a pervasive learning world. Becoming ever less valid to just Multiple Choice your assessments; Tin Can will record experiences not just scores. Other changes include continuous fluid formative assessment and Open Badges. Most people in the room didn’t seem to know about Open Badges so changes to certification took up quite a bit of the session, there was an argument that the key point is that they do expire so can enforce keeping your skills current. There was general agreement that rigor and creditability will be needed for them to be a success but I would suggest we can see badges becoming like anything else – there will be a mix in quality. We are kidding ourselves if we think every university course is comparable, YouTube videos vary enormously, etc. – Open Badges will vary too, as part of an open ecosystem. 4 – Design and delivery challenges. Content and learning to be pervasive to all devices, for example, need to move away from Flash. 60% of smart phone use at home so talking multiple ‘devices’, not ‘mobile’. However, for producers/editors there are major issues with multiple versions of same product, so aim is for versions that respond, not multiple versions. Some issues with IT still although departments are opening up to Open Source, BYOD, etc. Kineo have responsive design solution to get around multi device world, Adapt framework – have open sourced it and trying to work with Sponge and LearningPool on this [I had not realized at the LearningPool event that their authoring tool changes were the same thing as this]. There was a brief demo of the tool’s output, including arguing for benefits of a scrolling approach to navigation design rather than old click-through-PowerPoint style. Bookmark and tracking in LMS will treat an item accessed as one item (i.e. move learning toward the ‘Netflix experience’). They have an online community in place to support the launch of Adapt and it should be released from early January but are using it in some places – showed public scout training. Another advantage of html is that it is searchable, so can help with the move from course to resource models. In designing higher empathy learning, follow ideas of Charles Leadbeater, we need to move to high system/high empathy learning. Personalize what we offer in the way other systems do (for example Amazon and Google are highly personalized) – Amazon even recognizes when you hover over something but don’t click on it. 5 – Line managers remain critical. Managers essentially a tool for ensuring empathy at lower systematic level, for example informal coaching. Time with manager the most important thing for many people when considering development success. 6 – Never underestimate learners’ ability to help each other. Includes, but not limited to, social media. L&D can help people be more efficient social learners. 7 – Informal learning must not become chaotic. The risk/danger is that single sources of truth are lost in situations where they remain relevant. However is it L&D’s role to say what should be used? Here arguments for acting as a filter, via curation, came up again. Other options exist too, including Google taking authorship as content authority in search results. Search internally should recognize importance of author and how much an item has been shared (Google uses shares in search results – power of individuals outweighing automation). Individual voice needs to come out more in internal resources including eLearning, ultimately it is difficult to empathize with anonymous, designed by committee, resources. 8 – Develop people internally. This wasn’t really covered due to time – from the report: “With hiring freezes and a desire to recruit for ‘will not skill’ there’s increased focus on internal development through apprenticeships, accreditation and qualifications. Thus a challenge is developing cost-effective trainee/apprenticeship programmes of learning”. 9 – Rapid development as a solution to ongoing more for less. More demand for evidence from investments will lead to further innovation in area of costs. 10 – Learning will follow web tech, try not to fall too far behind. We need to look at how Hummingbird is changing the web, what Google Now is offering our staff, etc. Finished with the question ‘if Google was building an LMS what would it do’ against a list of the current problems with L&D setups [of course Google has dallied in the area as seems to now be throwing itself behind EdX]. The day closed with a Q&A panel discussion. Summary of the discussion, including the main arguments, included below. Still a place for the classroom? Yes, but change those spaces (more flexible, sofas, etc.) and roles (facilitate). Flipped classrooms can extend to organizations’ room design; make offices for collaboration not sitting in a cubicle. Classrooms are an invention, will move back to experiential learning. Can replace and augment, but are physical elements that can still best be done in classroom. Is humour is missing/impossible in eLearning? Are some good examples, e.g. Video Arts. Mention for John Cleese on creativity, issue is people think serious is solemn. One way is to include Easter eggs for humour, to reward engagement, etc. If difficult to work in, always option to deliver alternatives (inc. coaching) for those who need them. Should get easier with HTML5. Basic stuff should be easy to meet, can always try and familiarize yourself with what your organization needs on top of that. Rapid tools often claim more than they actually can do in this area, especially when compared to Section 508 – tighter than what we have in UK. Need to ensure have alternatives, JAWS compatability, etc. Have to think about it, can code in descriptions for JAWS. Recommendation [that I would echo] for TechDis for advice, etc. Are some virtual humans emerging to supplement training in place of actors, etc. Overall view – better if own face for personalisation. However, to an extent, it depends on the situation – including if want people to be able to fail or provide feedback safely. If honesty needed, should use representation of yourself. Top tips for starting with mobile. Get on with it, acknowledge mobile learning has started. Aim at challenges people/organization face. Highlight apps that exist to people, including curate productivity apps you would recommend. Plug for Kineo Adapt again as possible game changer as big challenge has been cost. Video and mobile combined is the real possibility [it was interesting that video was such a big theme in the day considering Bersin’s latest report]. Ability to measure the unconscious via neuroscience enhancements. Wearable devices will be big thing, inc. recording of unconscious and emotions (Japanese – ears and tail!). Need to be more scientific in use of data, including for personalization. We need to change and do things differently not about tech per se. Today and yesterday I have not been very well and as such have not made it into the office. As I did not have my work PC at home I have not been able to do a lot of the things I would normally and I am taking today as a sick day. However, yesterday I was able to catch up with reading, write up notes, deal with emails and conference calls (via my mobile) and attend webinars, effectively still working a full day. This really just confirms how flexible we can, or should be, in today’s environment. Yesterday I felt ill/tired but able to perform tasks at my own pace, today I do not have as many tasks I can do remotely and really need to rest up. Argue need to change the classroom, partly due to technology held by students. Showed information on local history project, one of collaborative global projects on iEARN platform. ‘Live the history’ via combining site visits with mobile technology. 21st Century Skills include mentality of global citizenship, including research into environmental issues [particularly interesting considering the challenges faced by Syria] youth organised and managed. “iEARN students are not typical students” – something for for recruiters at universities and businesses to consider. Project based learning way to avoid information-delivery style learning/teaching. Research, report writing and other skills developed. ‘Peace starts here’ tagline for the charter with video confirming scale of global adoption (on http://www.fetzer.org/ channel). New to me I think, but core idea about encouraging people to be ‘compassionate’. Born out of idea from TED – interesting to see something come out of TED beyond simply ideas/theory. Have a stream of activity for chartered schools – based around 3 simpler ideas, basically about being good citizens. Perhaps this is the post-religion way to organize morals? I have tried to attend bits of GlobalEdCon in, at least, the last couple of years. It is impressive if only for the scale, logistics and spread (for example session 1 above only had 10 people attend but they were split between the US, UK, Syria and China; session 2 was mainly North American delegates but also the Caribbean, Zagreb and me!). 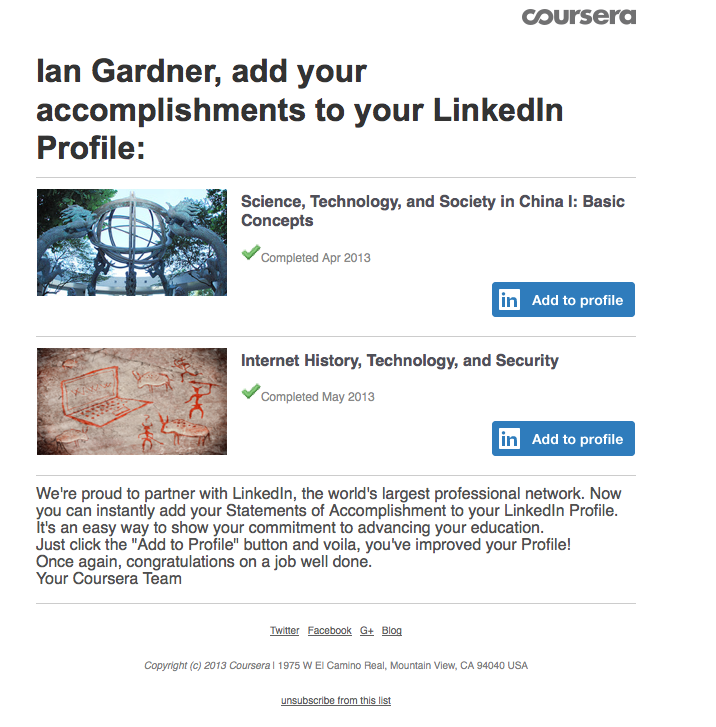 Coursera meet LinkedIn – LinkedIn meet irrelevance? A little odd that this seems to be presuming that completion of a Coursera short course is ‘certification’ rather than education, especially when the business model for many contributors is potentially tied to issuing university credits. 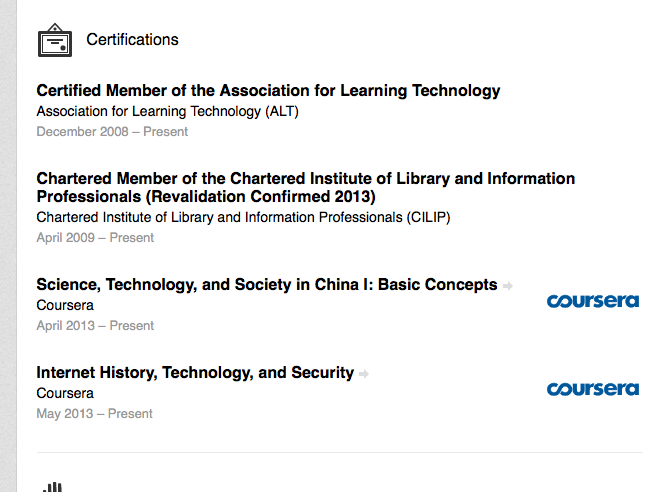 It also seems odd that when MOOCs are proving the value of short courses (without the disproportion high costs of many short courses) they represent these with individual listings on LinkedIn, I doubt anyone lists every short course they have done. This becomes especially problematic when you think of the full range of informal learning that someone can do, is a Coursera certification more valuable than a Tweet of praise, a positive Slideshare comment, etc? However, this comes with problems as they seem relatively random updates. Potentially you could appear certified in “Archaeology’s Dirty Little Secrets” without any context. So, how could they be better? Well Tin Can and/or Open Badges might offer a solution in feeding to LinkedIn selected development activities that you want to present. These could appear in their own section rather than forced into certifications. Indeed the problem I am having with these changes is perhaps that they are leading to ‘scroll of death’ on profiles, would it not be better to link out to a store such as a Tin Can LRS profile, much in the same way you have ‘personal website’ links to allow you to show reflection on your blog? 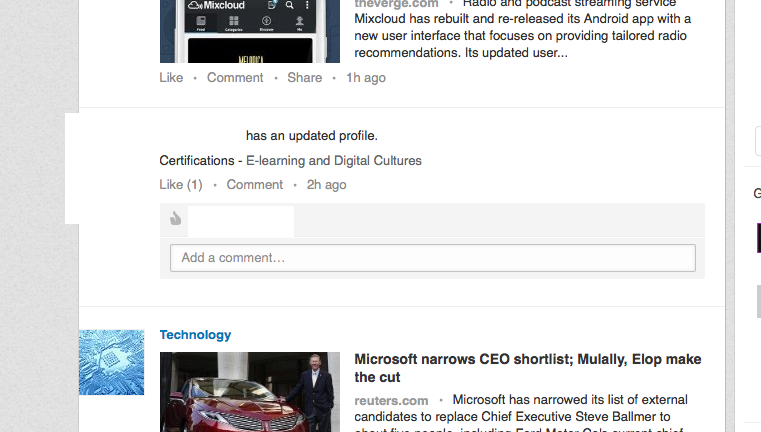 Presumably Coursera is just the start (or might not be and I just have not realized this already existed) and LinkedIn will be looking to aggregate, in place of Open Badges, work done on other platforms. Overall, a riveting development but another which threatens to put too much information into LinkedIn profiles and create barriers to career-centric conversations.